AlphaNinja - Cell Phone tower operator/owner Crown Castle (CCI) reported earnings after the close - well rather, a lack of earnings. Net loss applicable to holders of the common stock was $23million, including a $58million loss on interest rate swaps. Crown Castle is in a fantastic business. They have long term leases with the "big 4" wireless firms (Verizon Wireless, AT&T, T-Mobile, and Sprint) in the country's best markets. 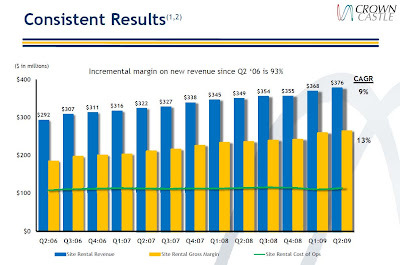 As the slide below shows, the upside on rental site revenue growth (baked into those long term leases) greatly leverages the much lower costs required to operate each site. So what's the problem? Well for starters, that slide was part of CCI's presentation at the Deutsche Bank LEVERAGED FINANCE conference. The bulletproof-looking cash flows of this business enticed bankers and management to take those beautiful cash flows and lever them to the moon with debt, now totalling about $6.8billion. To CCI's credit, they have dealt with refinancing very well. Maturities are pushed out, and based on this quarter, the cash interest expense looks to be at about a rate of 6%. 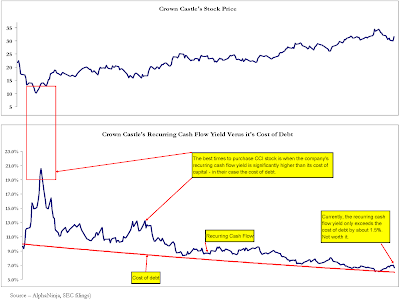 The problem is, Crown Castle's own estimate of "recurring cash flow" (I use "Free Cash Flow", but they're pretty similar in Crown's case) leads to a yield of 6.8%. With cost of capital at 6% and return on capital only a little higher, I'd pass and wait for a better entry point.